I’m a big believer in the saying, “eat good, feel good”. Actually, I’m not very sure that’s an actual saying, but hey, it makes sense don’t it? So for dinner today I made Cajun Lobster Tails. 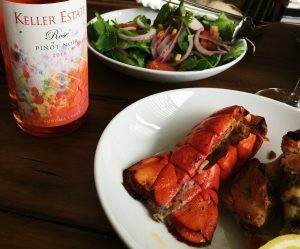 It takes literally 15 minutes to pull off this fabulous dinner and it will pair so well with that bottle of Rosé this summer. Preheat broiler to high. I’m sure you can use a hot grill in the summer if you wish. Slice open the shells of your lobster tails and spread open. 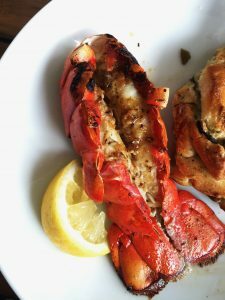 Brush with melted butter and season with your Cajun spices. (Or, like the guys at Mangia.tv say, “make it rain”). Squeeze a little lemon on top. Broil 10 minutes on high. Serve with a citrusy salad, some garlic bread or whatever sides you desire and a good glass of Rosé.